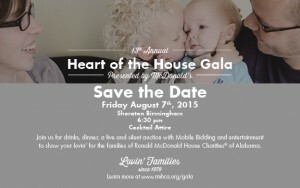 Join the Ronald McDonald House for the 13th annual Heart of the House Gala to be held on Friday, August 7th at the Birmingham Sheraton Ballroom from 6:30-11:00 p.m. The Heart of the House Gala sponsored by McDonald’s is the Ronald McDonald House’s largest fundraiser of the year. Auction items feature trips to St. Thomas, Italy, Las Vegas, and beach getaways as well as Alabama and Auburn football packages including tickets to a game, awesome art, dazzling diamond jewelry, children’s goodies and much more auctioned off by Christie King of C King Benefit Auctions. Mobile bidding is new to the event this year along with entertainment after the program. The night will be hosted by Calvin “Speedy” Wilburn from the Rick and Bubba Show featured on 104.7 WZZK. Unfortunately, Alabama has one of the highest infant pediatric illness, injury and disability rates in the nation. Ronald McDonald House Charities of Alabama is Birmingham’s only affordable provider of temporary housing services focused on serving sick or injured children and their families who must travel to Birmingham for medical care. Without the Ronald McDonald House, many parents of sick children would sleep in hospital waiting rooms or in their cars. Event proceeds will benefit the Ronald McDonald House in Birmingham and also provide funding for the Ronald McDonald Family Room at DCH Regional Medical Center in Tuscaloosa. For ticket or sponsorship information, please contact Kathy Robson kathy.robson@rmhca.org or 205-638-7258.